Priceless Views at a Steal of a Price! Totally restored unit! Lovely trayed ceilings in a gorgeous granite and stainless kitchen! All new paint and updated baths. Tucked away on the western end of Bay County at Carillon Beach is a quiet little corner of the world, Pinnacle Port Resort, a privately gated gulf-front family resort located between the world's most beautiful beaches and Lake Powell. Offers a climate that beckons year round. 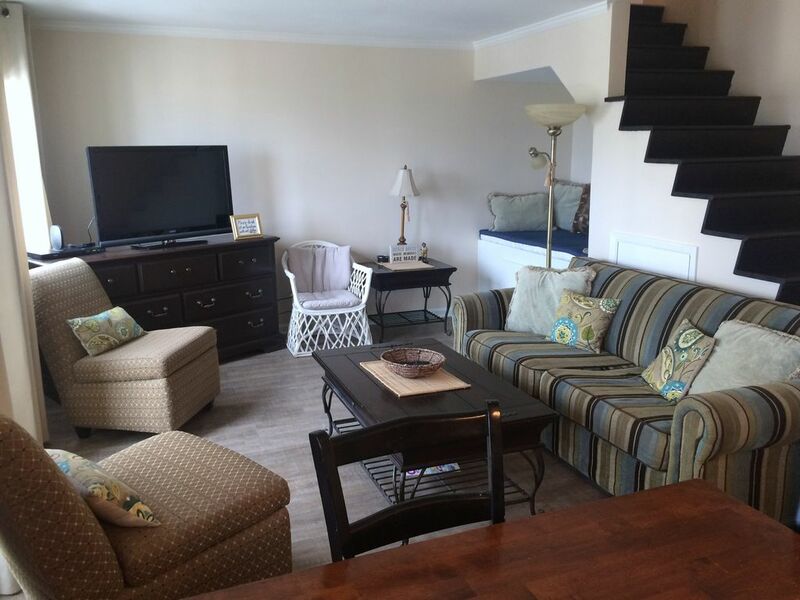 Our exceptional two bedroom/two and one-half bath townhouse features a fully-equipped kitchen, washer/dryer, three cable TVs, a queen size and two twin size beds, one new queen sleeper sofa, all linens, and a two separate balconies directly overlooking the Gulf. Entire interior has been updated! All repainted, new tile floors and lovely furnishings throughout. The bedrooms are totally renovated with new cabinetry and vanity area. Spread out and enjoy the luxury! Please, only rental will be made to guests over 26 years of age. In addition, Pinnacle Port Resort provides 24-hour on-site security and a host of FREE other amenities. Shopping, a supermarket, restaurants, and lounges are adjacent to the resort, while golf and the attractions of Panama City Beach and the Beaches of South Walton are just minutes away. If you're looking for a quality getaway in a serene environment where the typical excitement and restaurants are minutes away - You've found it! We'd love to have you as our guests! Call or text at six seven eight 520 838 seven for my best deals ! We're a family of four with 'ties' to the Gulf Coast. We have always enjoyed the quality family time we have at the beach and take pleasure in being able to provide a great unit at a fair price for others to enjoy! You can always call or text at six seven eight 520 838seven for the lowest deals! Pinnacle Port is priceless!! You stay in a gated community that is between a private home community of Carillon Beach and the state park. Total privacy and not too crowded. However, in five minutes you can be at anything you want from Pier Park to Thomas Drive. Or, venture to the West towards Destin!! A great location! toilet, combination tub/shower, tub, Freshly updated! toilet, Laundry Room conveniently downstairs! Many units have bay views and side views, but here you'll enjoy a direct Beach view!! 20 yard walk from the elevator to Sand! Fully furnished all new stainless appliances! Private views directly on Gulf! Rent one for the lake or Gulf! Rent a bike at Carillon! Public boat launch on site! 4 lit courts for nightime use! Large 42' Flat Screen, 3 Cable TV's, wireless internet, DVD/VCR, New Refrigerator, All new paint, curtains, comforters and tile throughout!! Total renovation - Granite and Stainless! All new appliances! We loved the condo, would definitely come back. It was absolutely amazing. We were not disappointed. There was plenty of room for the 7 of us. It was clean and nicely decorated. We all had a very nice time.We will definitely be staying again. We work hard to provide the quality we know you expect for the amazing getaways! Thanks for staying! We truly enjoyed our stay. Marc and Angie put a lot of care and thought in making one feel at home. Everything you need to be comfortable was available. Awesome ocean views from the master bedroom. (2 balconies). I recommend this condo for a small family. No need to worry about packing up and driving to the beach. You will not be disappointed. So nice of you. Glad you enjoyed our little paradise ! Love staying at Pinnacle Port!! Great location!! Not crowded beaches. We know those beach moments are so special that we try to provide the quality unit you desire and the priceless views you deserve! Really nice condo with great access as described! Loved it and already booked another stay here for July! Owners were great! So kind and can't wait to have you back ! It's simple and safe! Bank transfers, Paypal and mailed certified checks preferred! Feel free to use a credit card for a nominal $45 fee. Bay County Tourist Tax of 5% and Florida Sales Tax of 7% are required to be collected.